This is what I did with the beautiful beets that came attached to the greens I used in last week's frittata, and the kale I had bought the week before. I needed to do something with the kale right away and I had half of the beet greens still left. I knew all three ingredients would go well together, but I wasn't sure how I wanted to prepare them. Before I decided to use them all together I was playing with the idea of making a batch of borscht, so I was anticipating that sweet and sour flavor and I didn't want to give up that idea. I thought about it for while the day before I was going to make whatever it was I was going to make, so I had time to think about the best way to use them. And that is when the idea to use borscht flavorings for a kale and beet (and beet greens) side dish came to me. I would make them sweet and sour and add dill at the end. It was an unequivocal success, and pretty too! This would make a beautiful, healthy, delicious addition to your holiday table. This dish can be served hot or cold - it is delicious either way. Remove the greens from the beets and set aside. Trim the stem end of the beets to about half an inch. Do not cut off the stems or the roots. Wrap each beet in a packet of foil, sprinkle with salt, and pour a scant teaspoon of oil over the beet before wrapping them securely. Place the foil packets on a baking dish (they will most likely leak) and bake until a knife inserted through the foil goes in and out without resistance, 30 to 40 minutes. Let cool, peel, and cut into half-inch pieces. Trim the leafy parts of the kale and beet greens from the stems. Loosely chop the greens and rinse them. Set aside. Chop the kale and beet stems into half-inch pieces. In a large skillet, heat the 2 tablespoons of olive oil over medium-high heat. Add the stems and cook until tender, about 5 minutes. Add the broth and season with salt and pepper. Bring to a simmer. Add the greens and stir until they have cooked down a little. Lower the heat and cover the pan and let the greens steam until tender, about ten minutes. Remove the lid, add the beets, and bring the heat back up to medium-high. Cook until the liquid reduces, about 5 more minutes. Add the vinegar and sugar. Taste and adjust as necessary to reach the desired sweet-and-sour flavor. Remove from the heat and add the dill. 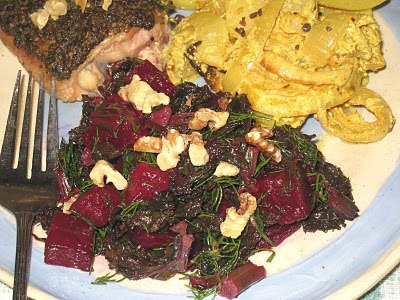 Garnish with walnuts and serve.